The content is well described by the 12 chapter titles: What are fungi? Fungi that live in water; The most ubiquitous of all fungi (principally the yeasts and molds); A diversity of form and function (within the ascomycetes); Morels, truffles, cup fungi, and flask fungi; Mushrooms and other larger (basidiomycete) fungi; Lichens—more than just fungi; Slime molds; The role of fungi in nature; Interactions of fungi and animals; Fungi and humans; and Fossil fungi. A glossary, list of references, and index complete things. The book reads rather like a textbook and the writing is generally clear and accessible. However, it lacks the abundant supporting diagrams, charts, illustrations, and tables that would be integrated throughout a typical textbook. Instead, it includes 124 color photographs, mostly of mushrooms and microscopic fungi or microscopic features of larger ones, grouped into two glossy-paper sections (a cost-saving, but convenience-reducing, move). While the photos are of good to quite excellent quality and admirably are reproduced at generous size, they don’t provide the level of assistance that many readers will need to fully understand portions of the text. For instance, it is nearly impossible to comprehend how a clamp connection forms without an accompanying step-by-step diagram. Another hindrance for many readers will be that a basic knowledge of general biology, such as an understanding of the concepts haploid, diploid, mitosis, and meiosis, is assumed. Although a glossary is included, many of the entries will be of little help and one probably would need to turn to a biology textbook or online biological glossary for assistance. Overall, the information is sound and I noticed no major errors. 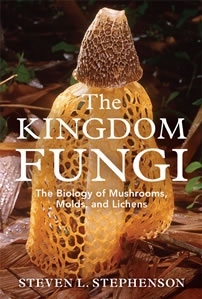 However, Stephenson is a world expert on slime molds and works far less with mushrooms and other “real” fungi, so perhaps it is not surprising that bits of missing or misleading information have crept into a book that covers such a wide range of subject matter. For instance, he gives an inaccurate characterization of the ericoid type of mycorrhiza. In one instance, he refers to chytrids as plants. “Loss of the expertise needed to collect and cultivate truffles” seems unlikely to be a major factor in the decline of their abundance in European markets. I find it hard to believe, given the incredibly high prices fetched by the Périgord and Italian white truffles, that modern trufflers no longer know how to find them or promote their growth in tended orchards. Far more likely is increased urbanization and all that goes along with that (which is mentioned as a key factor), such as loss of potential habitat and increased deposition of nitrogen, the latter of which appears to be the biggest factor in the historic declines in many species of ectomycorrhizal mushrooms elsewhere in Europe. Scutellinia scutellata is said to be very abundant and easy to identify, mainly because of its color and the eyelash-like hairs that adorn the edges of the cup. Actually there are a large number of similar-colored eyelash-bearing scutellinias that can be rather difficult to identify and many collections labeled “Scutellinia scutellata” on foray tables and lists aren’t that at all. Only a very small number of species of Cladonia (those placed in the genus Cladina by some lichenologists) comprise the bushy, much-branched types called ‘reindeer’ lichens, not all cladonias. Not all carbohydrates can be categorized as “simple” molecules, and cellulose is an example. In addition, there are quite a few places where editing to remove redundancy or to improve the flow of information would have made the text easier to understand. And, surprisingly in a book written by a professional mycologist, there are several instances where the plural ‘fungi’ is used when the singular ‘fungus’ should have been. Admittedly, these are mostly subtle points that could be considered nits, and many would not even be noticed by most readers. But that is the point. I think it is important for the information in books such as this to be as accurate as possible, because the intended audience is largely folks who do not have specialized expertise in the subject and are not likely to question details of the presentation. Despite these issues, The Kingdom Fungi could make a good introduction to the fascinating biology of the fungi for those who know little about it. However, if you already have a basic understanding and have other books such as Bryce Kendrick’s The Fifth Kingdom, then I’m not sure there is enough new ground covered here to make this a necessary addition to your library. This review was published in the September-October 2013 issue of The Mycophile.